Page 2 | News | Vitality Netball Superleague | The United Kingdom’s top level, elite netball competition. Wasps Netball opened up a nine-point gap on fifth-place Saracens Mavericks with a 58-51 win in Milton Keynes. The Black and Golds trailed following the first-quarter but Mel Mansfield’s side came back strongly in the second period to build a decisive advantage. The hard-fought win sees Wasps go level with Manchester Thunder at the top of the Superleague and take a big step towards a top-four finish. Mansfield said: “We said this was a big game and it’s a really important win for us to pick up. “I was really impressed with the defensive effort from the entire team out there but particularly the circle defence. “We played a really smart game and adapted well to the changes Mavericks made in their attack. “Fran Williams and Hannah Knights were excellent for us. They were aggressive and were really brave forcing a lot of turnovers. The hosts were fast out of the blocks and rushed out to an early three-goal lead. Fran Williams forced an interception to halt Mavericks’ momentum and Rachel Dunn capitalised at the other end. Mavericks were able to open up a four-goal lead, but Wasps immediately reined them back in, inspired by Bongi Msomi’s mid-court creativity. The hosts pushed the ball back up the court to score before the buzzer and take a one-goal lead into the second-quarter. Wasps scored first in the second-quarter through Dunn to level the scores and soon the Black and Golds led by two after a quickfire double. Amy Flanagan and Hannah Knights produced interceptions on successive possessions to give their side a foothold – capitalising on sloppy play from the hosts. Mavericks composed themselves, with ex-Wasp George Fisher enjoying a clinical shooting quarter, going goal-for-goal with Dunn. The visitors finished the half strongly with the duo of Dunn and Katie Harris exerting their influence to help Wasps to an eight-goal advantage. Mavericks forced two turnovers as they looked to reduce the deficit at the start of the third-quarter. 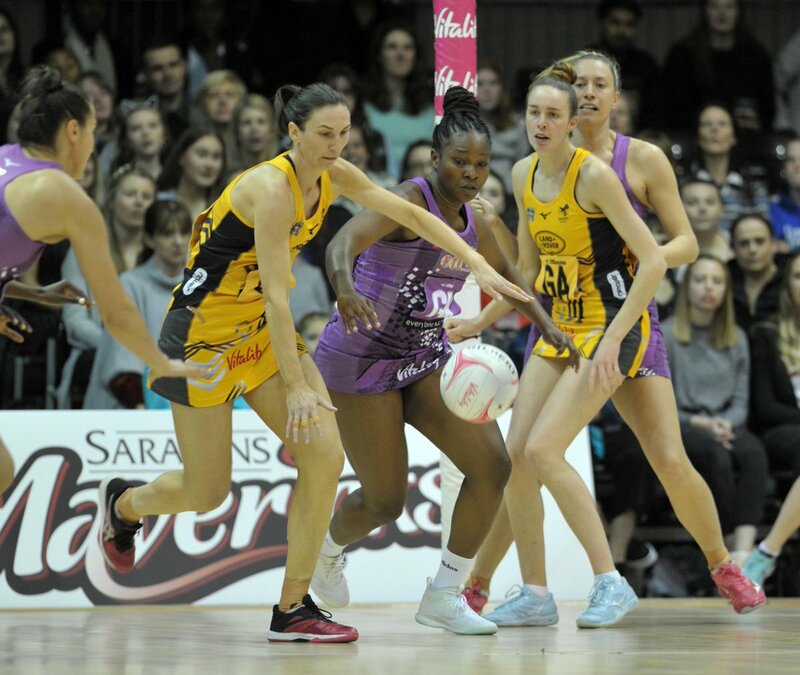 Sasha and Kadeen Corbin linked up well for the hosts, but Wasps kept working to limit attacking opportunities and were able to maintain their lead. Mavericks enjoyed the best of the action, finding their shooters well, yet still trailed by seven goals as the fourth-quarter began. Wasps started the final-quarter firing on all cylinders and within minutes led by 12, with Hannah Knights forcing a contact call to gain a key turnover and Jade Clarke following up with a tipped pass for the interception. A late rally from Mavericks saw the hosts register three unanswered goals to put the pressure on Wasps with a minute to play, but the reigning champions kept their composure to secure a 58-51 victory. Tickets are still available for the Vitality Netball Superleague Big Easter Weekend! 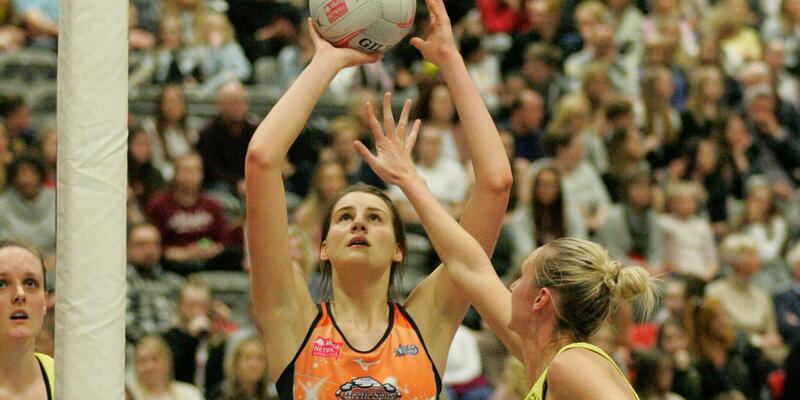 Severn Stars took three points from table toppers Manchester Thunder in a continuation of a rollercoaster Vitality Netball Superleague season. An all-round composed performance from the whole squad saw them earn the away victory at the Belle Vue Sports Village. After winning against Dragons and Sirens in recent matches, Stars travelled to Manchester on Saturday, April 13th determined to keep their run of wins. They came out firing in the first quarter with familiar turnovers from Sam Cook and Jodi-Ann Ward converted by Georgia Rowe. Stars took a small lead of two goals, but this was quickly reversed by top of the table Thunder converting three in a row to end the first quarter 13-11. Lucy Harris moved to centre and Iona Darroch to wing attack into the second quarter, but Stars started poorly and went down by five goals early on with the score at 19-14. More turnovers from the Stars defensive unit, incredible spring from Ward and repeated shooter contact on Cook meant that Stars went on a scoring streak, taking the lead to 19-20 with seven consecutive goals against the home side. Despite changes in the Thunder circle Stars took a convincing lead, 21-25. Thunder made several substitutions going into the third quarter and Stars kept their format, extending their lead to 28-33. The away side lost their flow and brought on Shona O’Dwyer at wing attack, moving Darroch to back centre but Thunder didn’t miss their chances and the score was neck and neck at 36 all. With a huge 15 minutes to play for both sides Harris came back to the court at wing attack and Thunder took the lead for the first time since the second quarter, 37-36. After thrilling end to end netball it was down to Stars to stay composed, protect the ball and convert their chances. They did just that and with more spectacular turnovers from Cook, Stars earnt the 47-50 victory. 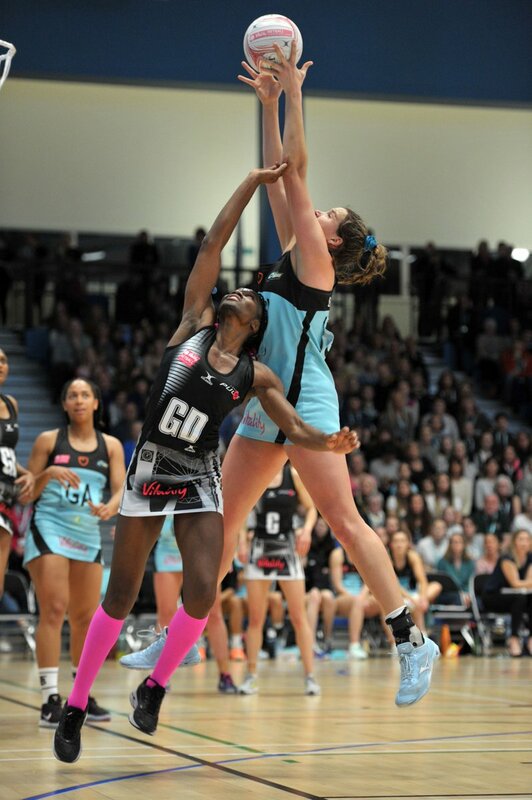 Surrey Storm edged a tight, tension-filled game at the Sports Park arena to record a second vital victory of the week. The lead changed hands several times throughout an enthralling 60 minutes but a resurgent Storm finally came out on top for a win which Mikki Austin declared perhaps more impressive than Monday’s win against Lightning. Storm raced into an early 10-6 lead but seemingly within seconds Pulse had reduced that to one goal and thus it remained. Storm led 17-15 at the end of Q1 but steadily the visitors wrestled back control through Q2. They edged in front for the first time midway through the second period but the introduction of Rhea Dixon at GA helped to redress the balance somewhat. Pulse led by three at half-time but that only spurred Storm into a comeback of their own. Within five minutes of the restart they had turned a three-goal deficit into a five-goal lead as Pulse managed to add just one to their total. Grierson replaced Wells in attack for Pulse and they clawed their way back into the game to give Storm just a one-goal lead at the end of Q3. Then it was Pulse’s turn to force their way in front going into the final ten minutes but steadily Storm rose for one final time. Mikki Austin’s bullet pass fed Burger to put Storm in front, 54-53, with two-and-a-half-minutes remaining and excellent game management allowed the hosts to see out the closing stages with a degree of control. Appropriately, it was Burger who netted the final goal to send Storm into next weekend’s Big Easter double-header with huge confidence. 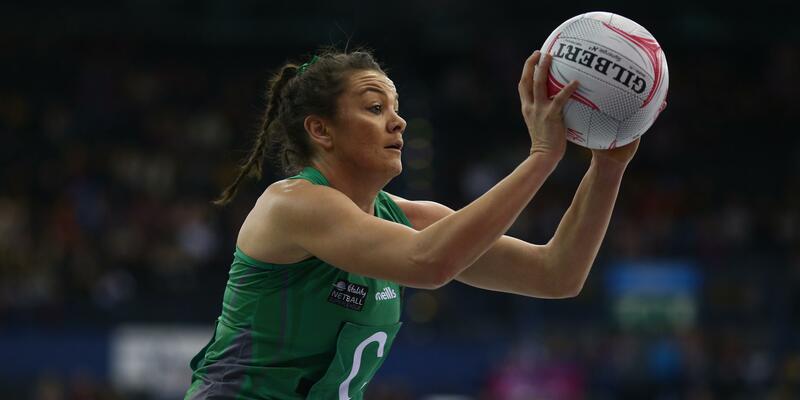 Celtic Dragons took to a brand-new Welsh Netball court at Cardiff Metropolitan University’s National Indoor Athletics Centre to face their fierce Scottish rivals in Round 14, knowing that a win was vital to keep pressure on the mid-table as the season enters its final phase. Despite a good save in the first minute from Stacian Facey, it was a scrappy start for Dragons whose second drive from centre pass was turned over by the visitors. However, accuracy was an issue for the Sirens’ shooters and Dragons were able to power their attack with some rebounds off goal at the defensive end. Nia Jones was able to effectively organise the defence of Sirens’ centre pass and she earned her first interception of the afternoon and helped Dragons take a narrow advantage after the first fifteen. The home side made a very assertive start to the second period, with Bethan Dyke darting around the court to find plenty of options for the Dragons drive. Dyke’s feeds into Kalifa McCollin kept the Sirens’ heads spinning all afternoon and despite the increasing levels of physicality in the contest, she showed no signs of the ACL injury that ended her season last term. Dee Bolakoro was also able to make a couple of trademark interceptions and Kyra Jones performed particularly well in defence and by half time the lead had grown further still. In the third quarter both sides seemed to lose a bit of fluency. Nevertheless, Chelsea Lewis remained strong under the goal and despite having some opportunities to make an impression on the scoreboard, Sirens remained adrift. Dyke continued to lead the Dragons attack and McCollin was also able to shoot some fancy long-rangers. Suzy Drane came on for Dyke at the start of the fourth quarter, her first start since an injury in the warm-up against Stars a fortnight ago. Dragons played with patience, Kyra Jones showing good control and decision making at the circle edge. Another tip from Facey saw the visitors’ last real chance to stage a late comeback go astray and Clare Elsley came on for Nia Jones as the game entered its final stages. Elsley made an immediate impact as she set up a great feed into McCollin as Dragons closed out the game and took a much-needed win in front of their biggest home crowd of the season. Head coach Tania Hoffman said: “I’m very happy with that win. The girls ground that win out in what was a very physical game.